I'm having a serious design dilemma with Stephen's Border. It may be a small garden but it's turned into a big problem. 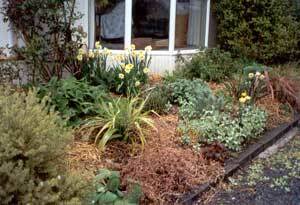 This border has had different planting schemes each year (if indeed any of the mismatched planting fill-ups could ever be called a scheme). It's been filled with reject dahlias and clary sage. It started life covered with cute knee-high pittosporums and bark chips. It's never worked. 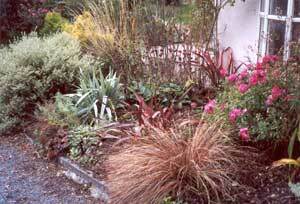 Garden design books say to start with the technical details, so I'll try that approach. It's in front of a curved bay window, and faces north west. The soil is dry and sandy, and it gets very hot in summer. 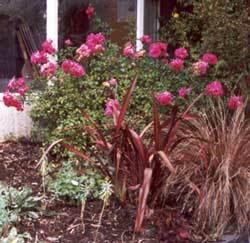 When we first arrived I ripped out the pittosporums (they would grow far too big), and put in a bright pink Flower Carpet rose brought from my old garden under the window. I suspect that this rose, planted thoughtlessly by default, is the cause of all my consequent dissatisfaction. Whenever it is in flower, things have looked dreadfully wrong, though the rose itself has been marvellous - strong, huge, absolutely healthy. One spring, oozing with confidence and temporarily forgetting the bright pink treat to come, I decided to try out a subtle colour combination in Stephen's Border. Out went the orange and red dahlias and in came some bluey-grey leaved Euphorbias (the New Zealand native Euphorbia Glauca), some silver artemesias, browny-red Heucheras and a dark browny-red flax. A silver Astelia was freed from its pot to fill up another space, and a tawny brown tussock provided textural contrast and an echo of the other russet tones. I liked the effect, and my designer confidence increased. I planted in some annual Cerinthe to fill up the spaces with blue and green. My daring colour design was a success, until early December, when that brazen Flower Carpet rose started throwing out long canes of shiny bright green leaves covered with bright pink flowers. I know there will be a very good colour reason why I've failed. Perhaps the colour combination of blue-silver and red-brown is too radical. But blue foliage generally is always easy on the eye, and silver Astelias usually shine no matter what the company. I keep coming back to that strong bossy bright pink rose. Perhaps it has unseen tones and tints which secretly undermine and sabotage. So what goes? That hopelessly cheerful rose, which flowers late and brightens up the driveway so much? How can I intelligently improve this border - more foliage? less colour? Load it up with irises and dahlias? Why can't I produce the right companions for the beautiful Euphorbia Glauca? The glossy gardening books are spread out on the coffee table, and my shovel is twitching. Watch this space! I couldn't do it. I removed the Artemesia, the self seeded white Lychnis and some green and straggly blue salvias that the bugs eat instead. The bright pink rose is reprieved.